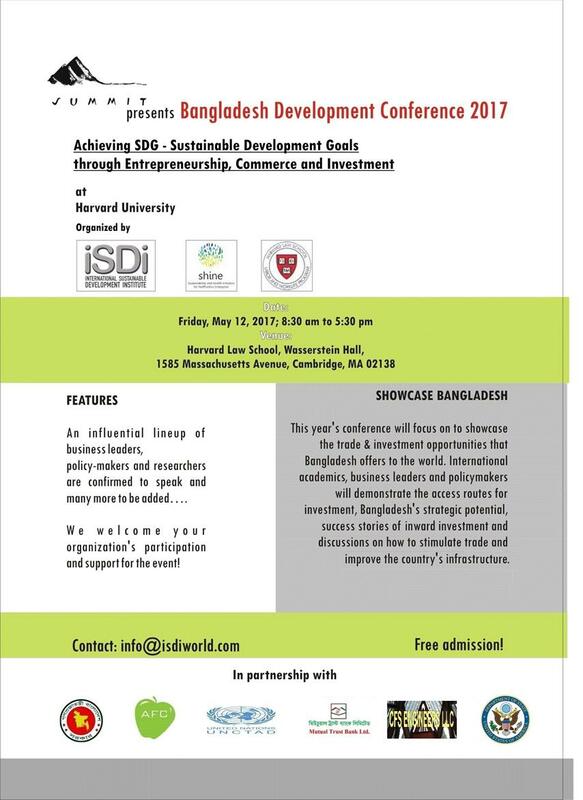 Achieving SDG - Sustainable Development Goals through Entrepreneurship, Commerce and Investment The organizing committee of the annual Harvard University Conference on Bangladesh invites academics, policymakers, practitioners, and experts to participate in the seminar on ‘Achieving Sustainable Development Goals (SDGs) through Entrepreneurship, Commerce and Investment’ that will convene on Friday, May 12, 2017 at Harvard University. The day-long seminar will be organized by the International Sustainable Development Institute (ISDI) in cooperation with the SHINE Initiative (Sustainability and Health Initiative for NetPositive Enterprise) of the Harvard T.H. Chan School of Public Health and Harvard Law School’s Labor and Worklife Program. The objective of this year’s conference is to bring together entrepreneurs, policymakers, and philanthropists who seek to accelerate the growth of Bangladesh through entrepreneurship, investment, and commerce. These can be powerful mechanisms for alleviating poverty and generating prosperity, which are important preconditions for achieving the SDGs. Moreover, they provide paths for empowering women, upgrading workforces, and transforming the rural economy. In this conference, we will explore the steps required to encourage these three vital facets of the development goals. The venue: Harvard Law School, WCC 2036 Milstein East C, Wasserstein Hall, 1585 Mass. Ave., Cambridge, Mass. Speaker(s): Dr. Chantal Line Carpentier, New York Office Chief for the UN Conference on Trade and Development (UNCTAD) and Iqbal Quadir, Founder and Director Emeritus of the Legatum Center for Development and Entrepreneurship at the Massachusetts Institute of Technology.